SSD uses V-NAND technology. V-NAND stands for vertical NAND, which contains flash cells stacked vertically and 3 dimensionally for greater density and speed. NAND chips have more memory than their stated capacity, about 4 percent. This is used by the controller for operations, and to replace defective cells. This spare capacity (over-provisioning) increases an SSD’s lifespan. In my opinion, endurance is the best feature. Endurance can be measured through a unit known as Total Bytes Written, which is meant to help users understand how long their drive should last. For the 860 Evo, TBW=1200TB compared to 300TB for the last generation, 850 Evo. It is not the fastest SATA SSD (up to 550 Mb/s max. sequential read and up to 520 Mb/s max. sequential write), but it comes close to the highest specifications of the SATA III standard (600 Mb/s). This SSD has an affordable price for a huge amount of solid state storage. understand how data is written to SSDs. With a hard drive, data is basically written serially, down a single channel. Inside an SSD, data is written in a parallel mode, down multiple channels to the multiple NAND chips at once. The more NAND chips an SSD has, the more channels it has to write/read across, and the faster the drive will be. So, for an SSD, a higher capacity means better performance. You can read more about choosing between HDDs and SSDs in this post. Before buying, you should ensure the compatibility of your motherboard with the SATA III feature of this SSD. The difference between SATA II and SATA III is the data transfer speed (SATA II – 300 Mbps – SATA III – 6Gbps). If you are not sure if you have SATA III, you can use this free program: HWiNFO. With cloud storage getting cheaper, you can keep more data in the cloud and less on your computer so you may not need as much storage space as you did a few years ago. In order to install it in your PC, you need to buy a SATA III 6 Gbps cable and a mounting bracket. It’s cheaper if you buy the bundle, not separately. 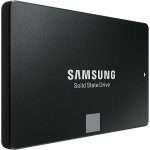 If you need to buy a SATA SSD right now, Samsung 860 EVO is the best option. An SSD is one of the best, if not the best way to upgrade any old computer that has a traditional hard drive. Even if your computer already has an SSD you can buy a bigger one if you ran out of space. 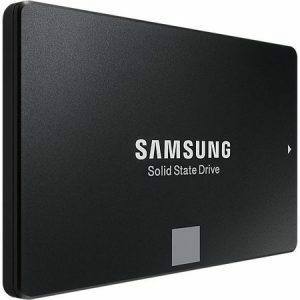 Check out the Best Sellers in Internal Solid State Drives here.